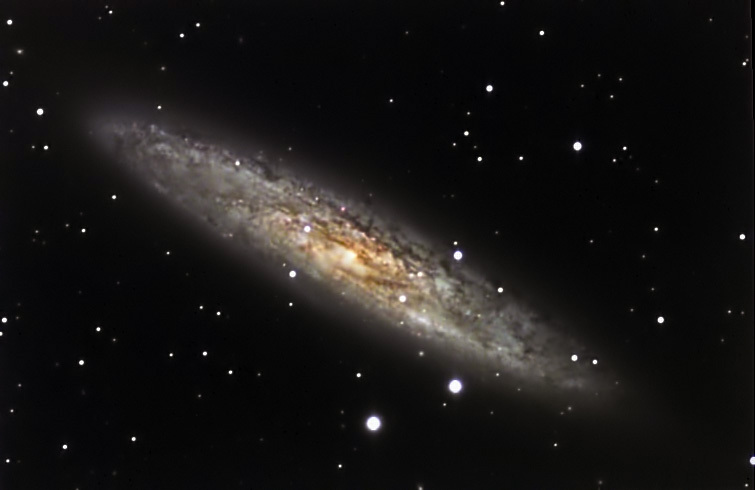 The Sculptor Galaxy, also known as the Silver Dollar Galaxy, is a starburst galaxy. This means that it is undergoing a period of rapid star formaiton. Seen nearly edge-on, it has huge amounts of interstellar dust. Exposures: L: 12 @ 4 min. RGB: 5 @ 2 min. Processing: Images were focused, captured, reduced and combined using CCDSoft. Deconvolution was done in AIP4WIN. The LRGB composite image was created in Photoshop and was adjusted using Levels, Curves, and Shadow/Highlight. Grain Surgery was applied for noise reduction. Location: My backyard observatory in SE Minnesota. Temp: 37F.